How to Convert Any MP3 to M4R as ringtone for iphone 5S/5C? I’m so excited after I got iPhone 5S from Apple store, maybe you have the same feelings. Now we can use this powerful mobile phone as we want. Ask Siri to report weather, record 1080P videos, play HD movies on iPhone 5S, or listen to music anytime, anywhere. iPhone 5S may attractive much attention in public place, at this time, we choose an appropriate ringtone is essential. Besides, you may want to use music as iPhone 5S’s ringtone, or just convert MIDI composed by yourself to iPhone 5S M4R format as ringtone. Here are some tips for you to convert audio to M4R format which is only supported by iPhone 5S/5C. A Computer running Windows or Mac. The mp3 file you wish to convert to m4r. It is a piece of cake from Pavtube video converter ultimate. this is a professional M4r converter which can easily convert a variety of video and audio formats to M4r and straight send the converted M4r ringtones to iPhone without iTunes. Certainly, you can also import the converted M4r files to iTunes first, then transfer ringtones to your iPhone via iTunes. 1. Download Pavtube Video Converter Ultimate. This software will help you to convert a few audio formats to M4R format, for example, convert MP3/WAV/WMA/MIDI to M4R, or convert OGG/APE/FLAC to M4R, etc. you can also convert audio between different formats. Install and launch the converter. Import the audio file you want to convert. Then click format column to choose output format. In order to make ringtone for iPhone 5S/5C, we choose iPhone > iPhone Ringtones (*.m4r). it’s the only ringtone format that iPhone 5S/5C supported. 3. Before conversion, you can click settings to set the profile. You can change codec, sample rate, bitrate and channels to appropriate parameter. 4. Click conversion to start. The software runs smoothly, and the audio quality is perfectly guarantee. After converting, you just need to load M4R audio to iPhone 5S/5C, then you can set audio as ringtone to 5S/5C, just enjoy it! Of course, as a Video Converter Ultimate, you can also convert Blu-ray, DVD and videos, including MXF, MKV, TS, TOD, MOD, FLV, F4V, AVI, VOB, MPG, MPEG etc. 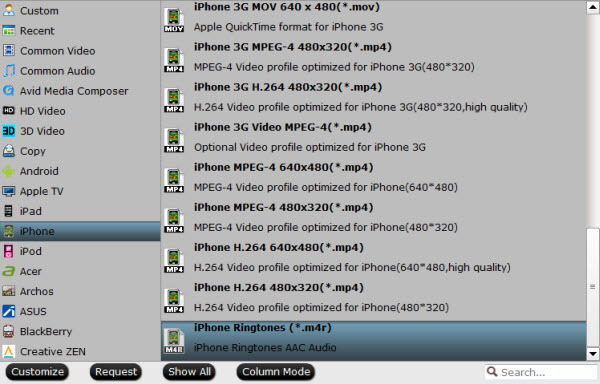 to M4V, MP4 or MOV format for playback with your iPhones. 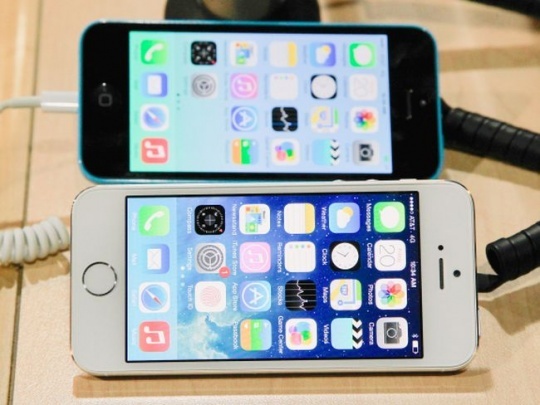 Videos look good on the iPhone 6/5S/5C, iPhone 5, iPhone 4S and iPhone 4. If you want to know how to convert YouTube MTV and common video to M4R as ringtone to iPhone 5S/5C, you can follow this article: How to download YouTube MTV and make it ringtone to iPhone 4S? they all the same ways. Success? I hope so. But don’t stop there! There are plenty of ways to take charge of your iPhone. It really is a powerful mini-computer. Enjoy your time! How to Rip your large BR selection to MP4 for using in portable devices?